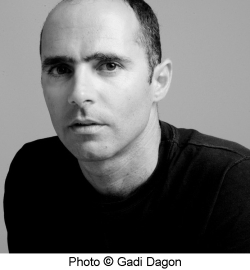 Eran Bar-Gil was born in Holon, Israel, in 1969. He studied psychology and comparative literature at Bar-Ilan University, and is also a musician. Bar-Gil writes articles and reviews for the Israeli press, and has published collections of short stories, books of poetry and novels. He has spent a few years between Israel and Africa and is working on a literary-musical trilogy whose first part, 1:1, was published in 2005. Bar-Gil has been awarded the Bernstein Prize (2006), the ACUM Prize for fiction three times (2007; 2010; 2017), the Johanna Prenner Prize (2008) for a film script based on his novel, Iron, the ACUM Prize for Poetry (2013) and the Prime Minister's Prize (2014). Saving Neta, a film based on his fourth novel, Iron, was released in 2017.